When you're right you're right: Georges Sada: WMD flown to Syria? 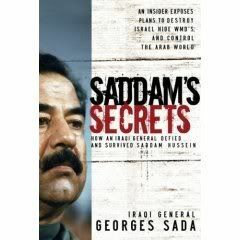 Well, Could the /WMD gases, be what Syria allegedly used against their own people, be part of the WMD's that Saddam Hussein, allegedly shipped via mass-transit to Syria, as General Sada stated? Where is General Sada now, and what is he doing? Actually, I am updating a mistake I allegedly made in a previous comment. I lived & taught in Nanjing, China for 4-years & have been back in the USA for 2 1/2 years.